Successfully Added Wireless PC Remote with Motion Sensor to your Shopping Cart. Elevate your presentations to the next level with the K46 Wireless PC remote with motion sensor. This device is plug-and-play ready and the signal strength is powerful enough to easily reach across large presentation rooms up to 15 meters in length, making this the perfect presentation tool + wireless media controller for any environment. Buy the K46 today and transform your boring presentations into attention grabbing masterpieces. The K46 is in stock now and available in single piece or bulk orders. Brought to you by the leaders in wholesale electronics, Chinavasion. What benefits does this remote offer over similar presentation remotes? Unlike other presentation remotes the K46 offers full mouse control from a distance of up to 15 meters and without the use of a table. You can use hand gestures to change slides during your presentations and also to navigate through web pages, computer programs or motion games! How do I sync the K46 with my PC? The K46 is extremely easy to operate. 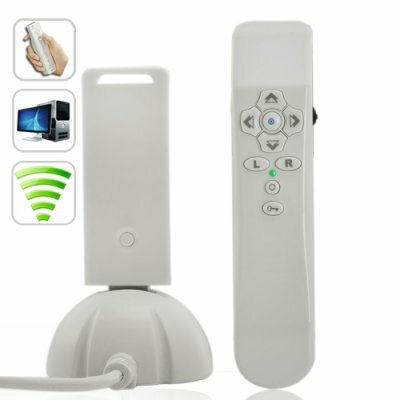 Just plug in the USB dongle to your computer, turn the remote power ON, wait 15 seconds, and then you will be ready to start using this amazing Wii-style PC remote.